Level 5 complete front axles for the GT-R. The GT-R Pro-Level Axle Kit feature a direct fit outer CV made from a high grade proprietary material. The GT-R Pro-Level Axle Kit feature a direct fit outer CV made from a high grade proprietary material. The GTR Pro-Level Axle/Hub Kit is the same set of axles you will find under the fastest GTR's in the world! 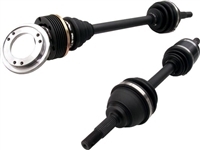 The GTR Pro-Level Axle/Hub Kit is the same set of axles you will find under the fastest GTR's in the world. 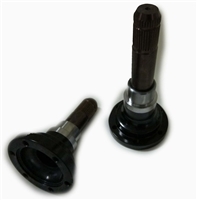 This set of stubs has been designed to eliminate the conversion plate supplied with the NI66 kits, and mounts directly to the 108mm CV on the axle. This upper and lower brace kit ties the differential area of the housing to the front half of the housing by tying the strong points of each half together. 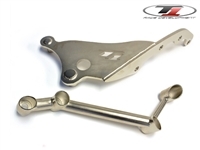 The GT1R R35 Transmission Overflow Kit is designed to allow you to be able to over fill the transmission with fluid to ensure no air is sucked up by the transmission oil pump under high G's. Introducing the Alpha Performance R35 GT-R Race X Billet Flywheel. Featuring a billet one-piece design, and integrated flywheel sensor ring, eliminating the need to bolt on the factory piece. This Billet Rear Differential Cover for the R35 GT-R was developed to strengthen the factory rear diff housing by utilizing Billet 6061 Aluminum instead of the factory cast Aluminum piece, and can be used with a variety of aftermarket rear diff braces. Professional installation is highly recommended as re-shimming may be required. The Alpha GR6 Filter Pickup Extension / Relocation kit solves this trans fluid starvation problem by relocating the pickup to the back of the trans pan. 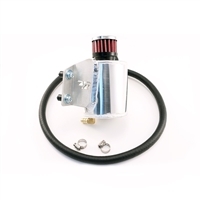 From the street to race circuits, the HKS DCT Cooler Kit for the GT-R has been developed to provide firm, positive shift engagement while assisting in the prevention of overheating the clutch and transmission. The Alpha Performance R35 GT-R 15" Drag Wheel & Slick Package was designed to be a much better solution than other drag radial or street tire options. Having the right wheel & tire setup for your R35 GT-R not only improves consistency and performance at the drag strip, it’s also one of the most important purchases you can make to ensure the safety of your GT-R’s expensive transmission and drivetrain. If you are serious about ¼ mile drag racing, it is certainly in your best interest to consider investing in a set of drag slicks for your GT-R.